This week is supposed to be wedding week. And I think we're going to be able to make it happen. My photographer (aka my brother-in-law), is amazing and will be turning around some pictures from the wedding that I can show you this week. Look for that starting tomorrow! And now, on a completely unrelated note: you know when life throws you a curve ball and you just run with it? Our "little" curve ball's name is Twiggy. Twiggle-stein. Twiggle-heimer-hoff. Twiggy is a 3-year old American Pit Bull Terrier. She is the most gentle, kind, and well-mannered dog... and anything but little. Twiggy was Daniel's brother Ian's dog. Ian rescued her a couple years ago from a shelter in California. When he moved to Idaho a few weeks ago, he and his fiancè weren't able to take Twiggy to their new apartment because Twiggy is a "pit bull." They searched and searched for a place in town that would allow renters to have larger dogs, and none permitted it. Ian was forced to find Twiggy a new home. He found her a home in Eastern Idaho, and two weeks ago he drove her out to meet her new owners. The owners seemed so reliable, responsible, loving, caring, and genuine. They claimed to have the large yard, the companion boxer dog friend, and children—it appeared to be the perfect situation. It broke Ian's heart to have to give her up. We thought all was well and that Twiggy was happy in her new home, until Thursday when Ian received a text that Twiggy was still very shy, wouldn't warm up to anyone, and that she had run away twice. Her new owners didn't want her anymore. Ian drove out the next day to pick her up, but the family refused to let him meet them at their home. When he arrived at their pick-up location, they returned the kennel (which was broken and dented—from what we can only imagine as being kicked), her completely empty food bin, and Twiggy, who was now underweight, lethargic, and terribly skittish. They didn't return any of the leashes, toys, or items Ian had given them. He realized what a desperate and abusive situation Twiggy had been in, and that these people weren't the people they promised to be at all. Ian didn't know what to do. He knew he needed to find her a new home—and fast—because she had been staying with us in the meantime. He was terrified to try to find a new family, and all the people who expressed interest in adopting her weren't going to be able to give her the amenities she needed. We had a big family talk on Saturday. Something needed to be done. Twiggy needed a home where her owners would love and provide for her, and a home where she was also able to warm up to and love her owners. It didn't take long for us all to realize that Twiggy was going to be adopted—by me and Daniel. She already knows us. She already listens to us. We know all her little details. We love her. So this weekend, Daniel and I added Twiggy to our tiny & new family. Twiggy and her whip tail. Twiggy and her glass-blue eyes. Twiggy and her sweet, sweet demeanor. Twiggy... our little curve ball who we are embracing with open arms & all the love in our hearts. She's so precious! That is TERRIBLE that people would do that to her. To think what people do to their dogs, it's just horrifying! I'm so glad that in the end, you and Daniel were able to take her! Oh, sweet baby girl. Some days I can't handle human beings and human beings who make laws regulating certain types of dogs when they ought to be regulating the humans who own them. Lucky Twiggy now secure with her own family for good. Simply put - in my eyes - you and Daniel are truly heroes for this. It brings tears to my eyes how badly pit bulls can be treated and how terrible the "breed reputation" is for these amazing dogs. No - I'm not a pit owner, but I would love to be some day! But I deeply appreciate any and everyone who opens their hearts to pit bulls. So great of you and Daniel to take her in. She is beautiful!! it's also a cool way to start your little family off right after getting married :) Can't wait to see more of Twiggy around here! Twiggy is adorable! I have a pit and it breaks my heart that pits have such a terrible rep when they are THE most loving dogs I've ever known. (It was hard for us to find an apt too with him but I would never, ever give Jinx up). It is SO wonderful that you guys decided to adopt her! This made my heart so happy and my me love your blog even more - I'm a huge pit bull advocate so it brings great joy for me to know another who loves and cares for these dogs who have such a bad rap thanks to the people mistreated them. I cried my eyes out reading this! Twiggy is beautiful and amazing and you and Daniel are doing such a wonderful thing! Enjoy being "rescue parents" it is the most amazing job! We adopted a pitbull mix an I wouldn't trade her for the world! She came from a bad situation and was left to die. When she came to the humane society, she was really sick. It took them 6 months to nurse her back to health. After we brought her home, she was very skittish and restless. Now she has warmed up to everyone including friends and family and she is the best dog ever! She is 50lbs and thinks she is a lap dog. Good luck with your new baby! She's beautiful! Shortly after we married, we adopted a stray kitten and it's been the best thing for our relationship. It's not as much responsbility as a kid but you definitely go through a small learning curve when you're both responsible for a living breathing thing! Awww baby love look at that beautiful girl. It breaks my heart that people treat anything that way. I want a pittie soooo badly but do run onto the issue of no one wanting to allow them :( you guys are amazing for taking that little beauty in! Awwww! Twiggy is a beautiful dog! 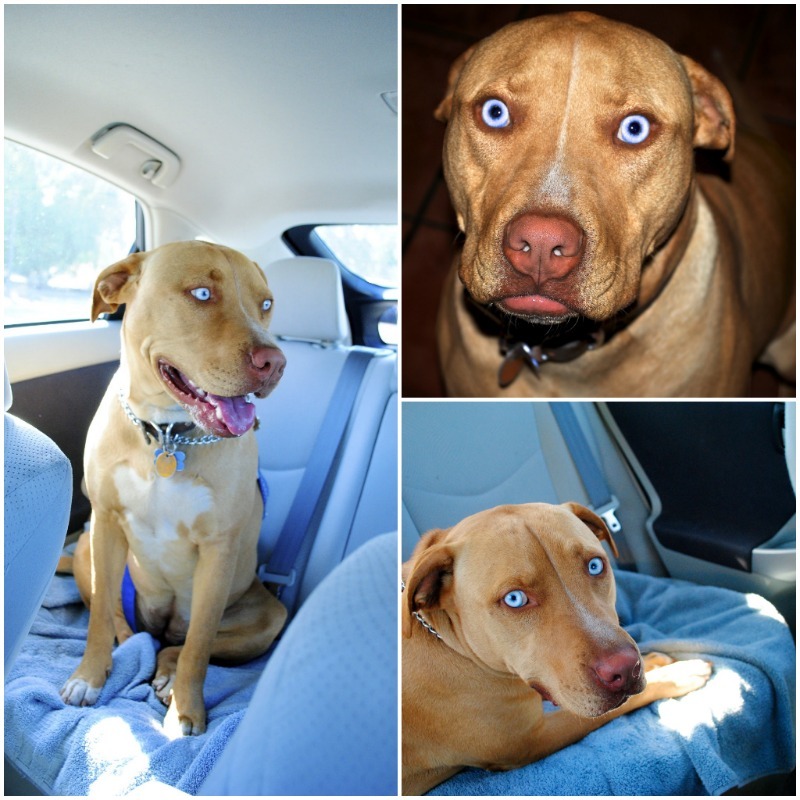 This blog pet broke my heart because I feel like people don't give pit bulls a fair chance! I grew up around them and think they make such wonderful pets. They are so loyal and loving! It's so sad that be first set of owners didn't work out and I don't but m glad that Twiggy found a new home, a better home with you! Hope to read more updates about Twiggy in future blog posts! I'm a huge dog lover!!!! There are so many things I hate about this post (the abusive situation and the fact that they couldn't find anyone who would let them have her because she is a "pit bull" at the top of this list), but the fact that the two of you took her in erases all of those awful things. So glad she has found a loving home! Can NOT wait to see wedding shots! She is adorable! I'm so glad she has a loving home! what a sweet thing to do :) Every pup deserves a good home. Can't what to see the Twiggster more around the blog! oh what a sweet face! that is awesome that you guys were able to adopt her! thank god your brother was able to get her back from those people!! can't wait to see more of her on the blog! It warms my heart to hear you are doing this. I love dos so much and wish I had a home large enough (and $) to rescue more. What a sweetie :) she is so pretty with those big blue eyes. I can't believe people that mistreat animals :( glad that you guys are giving her a forever home!!! THOSE EYES!!!! I don't understand how people can be so mean and abusive to animals and thank goodness they at least called and said they didn't want her! And that you and Daniel are able to open your home to her. My fur-baby is the light of my life and I am sure that Twiggy will being you guys much joy! I hate when people abuse animals and feel that there should be harsher laws for it. Twiggy is blessed to have been rescued by Ian, if not for that she wouldn't have such a loving extended family that was willing to take her in and love her the way she deserves. Can't wait to see her featured more on the blog, especially with those gorgeous blue eyes! Awe, that breaks my heart! So happy Twiggy has a great new life with you and your husband! Ugh, this made me tear up. I could NOT imaging giving up my Brody. Twiggy is BEAUTIFUL! I'm so glad she's been adopted by your family. How could you possibly say no to those eyes?! It's so sad to hear that people treat animals like that. Thankfully she now has a home with people who do love her and will treat her well! So absolutely sweet! What a perfect way to start off a new marriage: with those beautiful blue eyes running about the house! What a blessing y'all must be to Twiggy! And I'm sure vice versa! What a gorgeous dog and those breathtaking eyes. What a precious story. This post really touched me and almost brought me to tears. I've volunteered with a pit bull rescue for several years, and it absolutely breaks my heart how cruel people can be (to any breed). Pitties hold a very special place in my heart. I'm so glad that you decided to adopt her! I'm sure she will be happier than she can ever express with a loving household like yours! What a cutie! And she's got such blue eyes! I'm jealous! Awwwww! Good for you guys - what a precious new dog!!! :) I'm sure she is happy to be at her new home. Aunie... my eyes are tearing up here. I am so so happy that you guys are taking Twiggy. That situation sounds absolutely awful and it makes me so sad to think that anyone would want to be so awful to ANY dog. I'm sure Twiggy is thrilled to be with you and that way she's still in the family! And shame on those people. Karma will get them. It breaks my heart at how she was treated! I seriously don't get how people can be like that. Thankfully, they gave her back instead of just mistreating her forever! I set here with tears welling, how can people be mean to an animal? I just dont get it! Twiggy is blessed to have you and Daniel, people who will provide her a loving caring happy home! 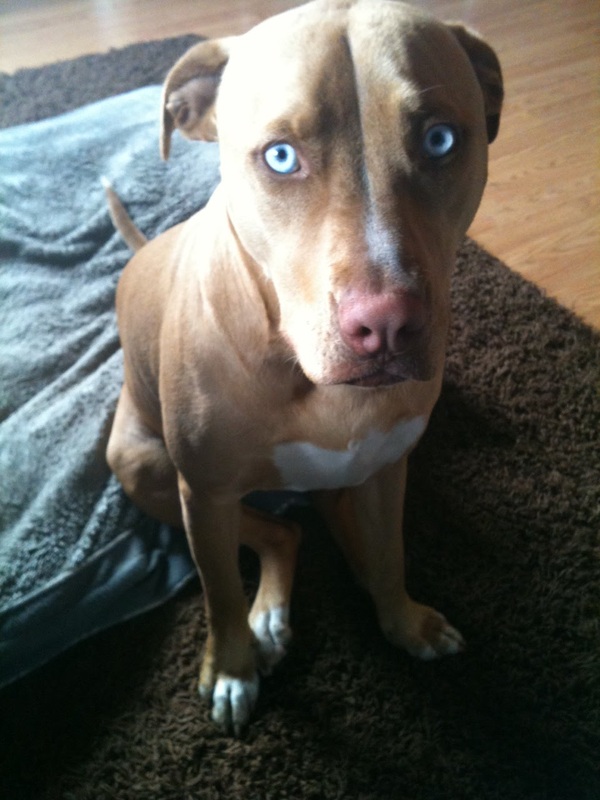 She is a beautiful beautiful dog, those blue eyes are amazing! But then, I get so happy when I hear of great people like you, that will give a pit bull a chance. Thank you! Also, congratulations on your wedding and I can't wait to see pictures!!! I am so glad Twiggy found a new home! I must say, she looks very happy and her eyes are GORGEOUS!!! Hi. I think you and your blog are just wonderful! It is so great that you and Daniel can take care of Twiggy, but what about the family and their kids? Maybe you guys can somehow check to make sure that families kids are okay? She is beautiful and I love how blue her eyes are! That's awesome that you were able to take her into a loving home! That's terrible that the other home didn't work out, but everything happens for a reason! aww that poor dog! I'm so glad y'all took him in! Such a gorgeous dog! The ice-blue eyes are to-die-for. Such a wonderful story too, so thanks for sharing. I'm sure you'll enjoy her! She has the most amazing eyes! I'm so glad you were able to provide her with a loving new home! i've never seen a dog with more beautiful eyes! congratulations new furbaby owners :) have you introduced Twiggy and Dobby yet? I think this post just made my day. Thank you for that. And thank you for having such a kind heart. My husband and I are currently trying to find a home for our pitbull mix and people like that are the exact reason I'm having such a hard time letting him go. I'm having our first baby in March and something happened in his life before us that made him get incredibly stressed with babies around. Just their cries on a video make him shake and whine unlike anything else. Both of our lives would be miserable with a baby in the house, so he's got to find a new home. But people are SO unwelcoming to pitbulls! He's the best dog I've ever had, but people just don't see past his tough looks. I'm praying God brings along a family like y'all to take him in! Twiggy is a lucky dog! How wonderful for her to be a new addition to your family. Congratulations! Her eyes are beautiful! She's such a sweetie. My little sister adores and has a soft spot for pit bulls and I'm glad you rescued her! It's so sad to hear about animal abuse these days. But Twiggy is such a cutie and looks like a sweet addition to your family. What an exciting new adventure you are on! All these comments from everyone are so heartwarming! We couldn't have found a better home for Twiggy, with our favorite brother and sister. We are so happy for you both, and I couldn't ask for more than to just know that she is in a great home - and not only that, I can see her whenever I want! Our baby girl is going to be so happy with you. I love you! What a stunning dog, I lover her eyes! she is the SWEETEST thing. happy for everyone! Twiggy is so cute!! My husband and I have a pit and she is just the biggest sweetheart. I bet your brother is so relieved to have kept Twiggy in the family. I love her eyes! How anyone can ever be mean to a dog is beyond me. So happy for you guys and that she found a good home! This is so upsetting. I'm glad she found a home now. She's absolutely gorgeous. I don't think I've seen such piercing eyes, even on a husky. Good for you! (And for Twiggy, of course!) Some people just should have dogs if they treat them like those people treated this cute dog. The blue eyes are definitely stunning! I have to say this totally breaks my heart about that family who claimed to give her the home she should have, but in the long run it's better for her to be with you and Daniel! And I'm glad Daniel's brother went and got her back!!! I have a pit bull and she is seriously the sweetest dog ever. she too was abused and neglected when we found her on the street at 8 weeks old. it was obvious she was being used as a "decoy dog" because she refused to fight. The vet was amazed that she recovered from the abuse so quickly! Needless to say, pits have a bad rap when it really is the owners of the pits that should be the responsible parties!!! it's good to see her have a good home now! Oh she is a GORGEOUS dog! I'm so glad you two were able to adopt her. It's so sad that people take in dogs and then abuse them. These are the kind of stories that break my heart. But at least she now has a good, loving home. Oh wow she has amazing eyes! How anyone can treat an animal bad is beyond me. I love that you guys rescued Twiggy though!